If you have been following my blog for a while, you would know that I love French Macarons. To be honest I am extremely fascinated by French Pastry and can never have enough of it. Even though I don’t have any formal training, I try to learn about it as much as I can through books and internet. In my opinion, there isn’t possibly a better cookie than French Macarons! 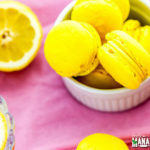 You have to bite into one of these gorgeous cookies to understand what I am talking about and if you have never had a French Macaron, you really don’t know what you have been missing out in life! 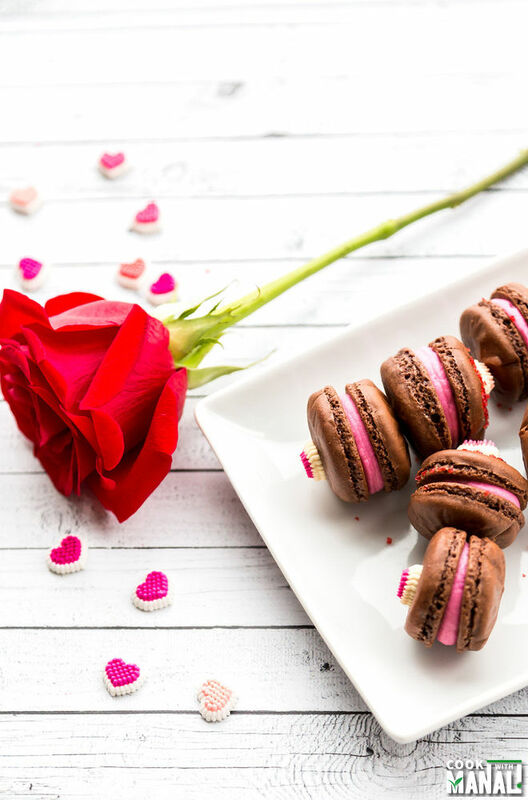 I knew one of the things that I wanted to make as a part of my Valentines Day series was french macarons. I always need a reason to make them, they are just so pretty and so delicious and they look so delicate. In short they are perfect for Valentines Day! I know a lot of people are intimidated by the thought of making french macarons at home. It scared me too when I first made them but now after making them several times, I feel a little confident. They are actually not tough to make at all, you just have to be careful about few things and your macarons will turn out just fine. Please refer to my post on Basics of French Macarons if you are going to make these for the first time. I have covered little tips and tricks which I learnt over the years. 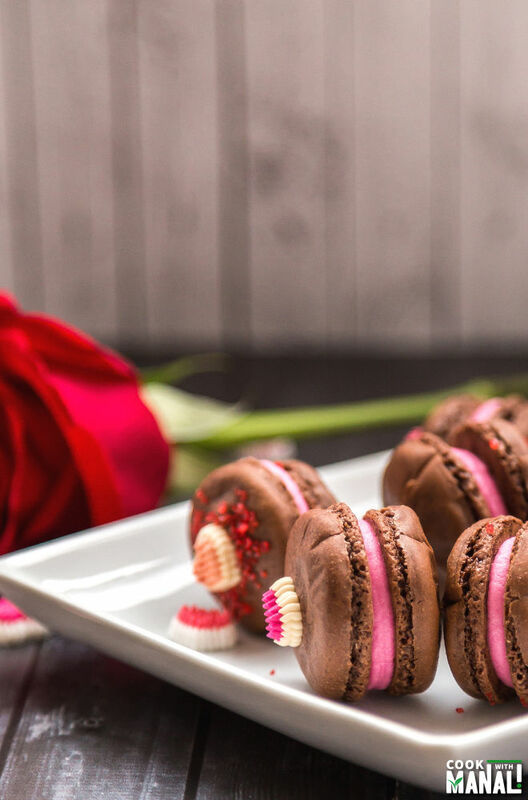 These gorgeous chocolate macarons were filled with a rose filling and I can’t tell you how amazing that was! <3 My husband said this is best filling/frosting he has ever tasted and he basically wanted me to make cupcakes with this frosting! I guess I will have to make this again very soon for him. Since macaron shells are pretty sweet, I did not add much sugar in the filling. It is also for this reason that I used cream cheese for it gives that little tart flavor and helps in reducing the overall sweetness. Because I made these for Valentine’s Day, I added some sprinkles/decoration on top of the macaron shells right after I piped them on the baking sheet. You have to put the sprinkles immediately as the batter dries out very quickly. I hope you do give these cute little cookies a try. They do take a little time to put together but one bite into them and you feel all the effort was worth it. In a bowl mix together almond flour, powdered sugar, cocoa powder and salt. Pulse them in a food processor so that it’s all thoroughly mixed. Sift the mixture 2-3 times in a bowl and set aside. This step is important for macarons to have that smooth top. Separate eggs whites [they are best separated when cold] and keep them at room temperature for an hour before you start working on them. You can even leave them for 24 hours, this recipe does not work if egg whites are not at room temperature. Beat the egg whites at high speed using the wire whisk attachment of your stand mixer or using your hand mixer When it begins to foam, add cream of tartar. Keep beating till it reaches a shaving foam like consistency and then add the granulated sugar. Beat more till the egg whites develop stiff peaks and are shiny. Fold the almond flour-cocoa mixture into the egg whites using a spatula. Don’t add the entire thing in one go, do it in 2-3 parts. As you start mixing, the batter will be tough at first but will loosen up as you proceed. Do not undermix and do not overmix either. The batter should not be runny but should still fall down from the spatula in a blob. Transfer batter to pastry bag fitted with a 1/2 inch round tip. Pipe the batter onto the baking sheet lined with parchment paper making small blobs around an inch big. Place sprinkles/decorations on top of the macaron shells as you pipe them. After you have piped all the macarons, let them sit at room temperature for 30-45 minutes, do not bake them immediately. If you bake them immediately, they will not develop their trademark “feets”. After the macarons have rested, preheat your oven to 300 F degrees. Bake at 300 F degrees for 15-18 minutes [time may vary depending on your oven]. Beat together butter and softened cream cheese till well combined, soft and creamy. Add in the powdered sugar and mix till well combined. Add the rose essence, pink food coloring and mix. The filling for the macaron shells is now ready. Once the macarons shells have baked, let them cool completely. Do not try to remove the shells before they have cooled down. Take one cooled macaron shell, pipe some rose filling in the center and place another shell on top of the filling to form a sandwich cookie. You should be able to get 50 complete sandwich cookies, lesser if you make larger macarons. If you can resist I would advise to store these cookies in an airtight container in the refrigerator for 24 hours and then eat them. The flavors settle in over the period of time making the macarons even more delicious. However if you can’t [and I don’t blame you for that] eat them right away, they are delicious either way! 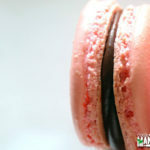 * Please refer to my post on French Macaron Basics for few tips and tricks on baking these cookies. * I used a rose extract that I got from India. Yours might be stronger so add only 1/4 teaspoon at first, taste check and then add more. In case you don’t have rose extract, use rose water in place but you will need to add more of it to get the flavor. 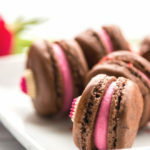 Chocolate French Macarons - Sandwich Cookies with a refreshing Rose Filling! Pulse them in a food processor so that it's all thoroughly mixed. Beat the egg whites at high speed using the wire whisk attachment of your stand mixer or using your hand mixer. When it begins to foam, add cream of tartar. Keep beating till it reaches a shaving foam like consistency and then add the granulated sugar. Beat more till the egg whites develop stiff peaks and are shiny. After the macarons have rested, preheat your oven to 300 F degrees. Bake at 300 F degrees for 15-18 minutes [time may vary depending on your oven]. Once the macarons shells have baked, let them cool completely. Do not try to remove the shells before they have cooled down. Take one cooled macaron shell, pipe some rose filling in the center and place another shell on top of the filling to form a sandwich cookie. For best taste, store these in an airtight container into the refrigerator overnight and then eat them! Thank you Anu! haha you are right…i try not to go through my favorite food blogs in the night..I feel like eating everything out of the screen lol! They are super duper delicious! I love those heart-sprinkles too. Gorgeous looking macarons, Manali! I would not need any reason to devour’em any day of the year! 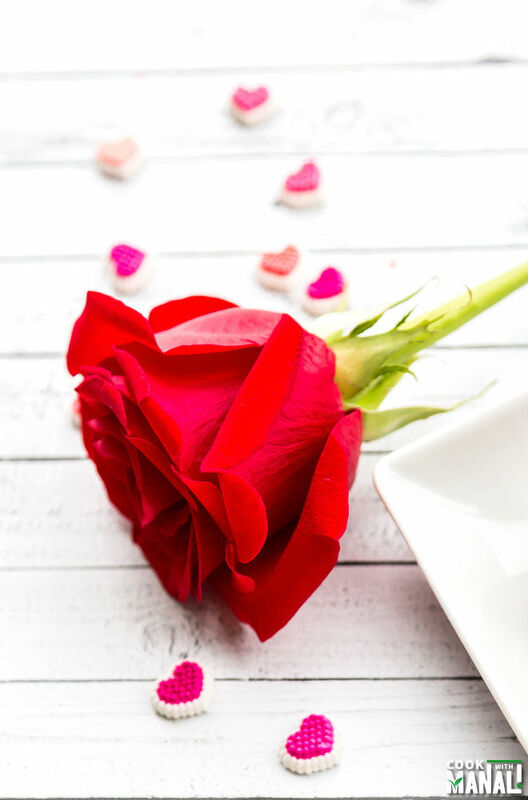 I must say, all your Valentine’s day series recipes are perfect! Thank you so much Savita! 🙂 Glad you like the V-day recipes! I’m impressed with your Valentine’s Day series. Everything looks amazing and so yummy!! I’m one of does persons that is afraid of making French macarons, I’m reading your tips and maybe I get inspired. These are gorgeous, Manali! I’ve never made macarons. They intimidate me a little. I think that needs to change soon! Your tips are so helpful. Thanks Jen! Oh you totally need to, you are such an amazing baker..it won’t be hard for you at all! Glad you find the tips helpful! These macarons are beautiful, Manali! Looks like something that would come out of a bakery! They look delicious, too. Pinned! Thanks Gayle! 🙂 Have a lovely day! Those are stunning! You are so good at making beautiful food! 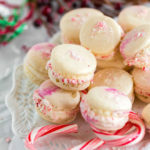 I’m intimidated by macarons but they are on my baking bucket list. The Rose filling…. sounds amazing! Thank you my friend! 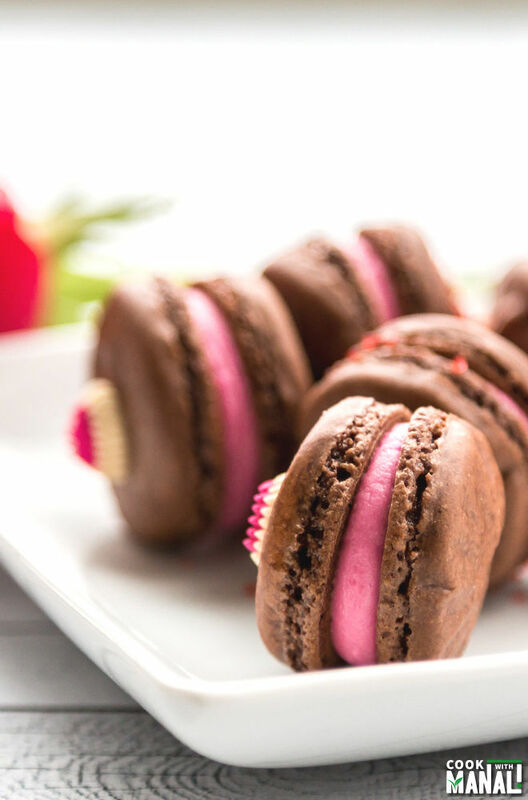 You definitely need to make them, macarons are delicious! Those are absolutely beautiful – I love the sprinkles on top, so pretty! And rose filling sounds incredible. Macarons are definitely on my bucket list, I haven’t got to them yet, but I certainly intend to! So pretty! Wow Manali, these are beautiful!! Thank you Sarah! Glad you like! Woah! Manali! Those macarons are incredible. I tried making them once at home, and they were an utter fail. They spread out in the oven into these large, cookie like things…totally not what they were supposed to do. Needless to say, I was disappointed. But that was a couple of years ago, and I guess I should try again. I’m bookmarking your macaron post as a guide for whenever I have time to try again! Love these…pinning now! I think you convinced me to get over my fear of making macarons, because these look absolutely perfect! And so beautiful with that rose frosting filling! Manali… these macarons looks perfect!! I need to make these soon. I love them so much but I have never made them. You inspired me ;-). Pinned!! Absolutely stunning! I’ve never made macarons but have happily indulged in them a couple of unforgettable times. Now I know where to go if I want to brave making them myself. Great job! Thank you so much Andrea! 🙂 You should give them a try! Manali, I just made my first batch of French macarons today! They’ve been on my bucket list forever, and I was intimidated for nothing…they really weren’t bad at all. I didn’t have time to chronicle them with step by step photos, and I love that you did that. It’s always so helpful! Next time, because there will be a next time. 🙂 I love these gorgeous cookies with that beautiful pink rose filling! Manali, just…wow. These are too good for words! This one’s a new favorite! Thank you so much Mir! 🙂 They are my favorite! Thanks for visiting my blog Rumana! glad you like the macarons! Oh my gosh Manali, I adore macarons too and yours look absolutely gorgeous! 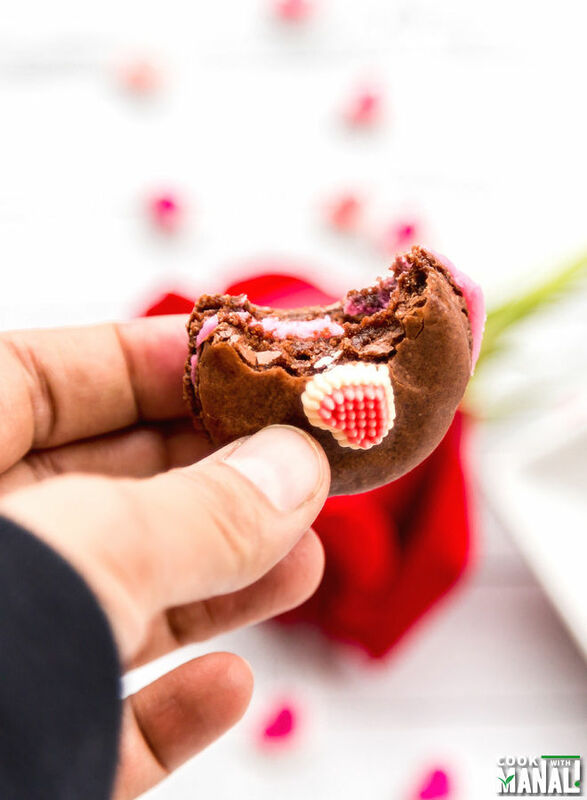 Love the rose filling, so pretty and perfect for Valentine’s Day! Thanks Kelly! 🙂 I loveeee macarons! oh my!I always wanted to try macaroons at home and I guess the right time is come 🙂 They looks so perfect, cute and delicious dear. Thank you for such beautiful share ! Thanks Kushi, you should give them a try! They look beautiful and absolutely delicious! Would love to try making them but can they be made eggless ? Look forward to hearing back from you, thanks! Hi I love ur recipes and I live macaroons. But I am a vegetarian. Any chance of u giving me a macaroons recipe than can be made eggless? I have searched but never found any. 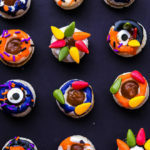 What would you recommend for substituting cream cheese in rose filling? I’m from Poland and we don’t have this cream cheese that is available in Great Britain or USA. Can I use mascarpone instead?